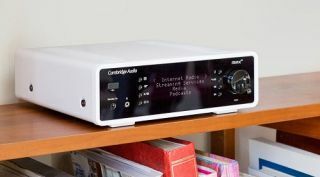 Cambridge Audio Minx Xi is £600 all-in-one streaming system | What Hi-Fi? Cambridge Audio has announced the Minx Xi, a new all-singing, all-dancing streaming system with aptX Bluetooth, high-res audio support and analogue and digital inputs. The Minx Xi is the latest addition to Cambridge Audio's Minx family of wireless speakers, which includes the Minx Air 200 and Minx Go. This latest system has more in common with the NP30 streamer, but sports a smart new front panel, and aims to be the "digital music system that simply plays it all" with wider file support and enhanced connectivity. Boasting "audiophile components" such as the 24-bit/96kHz Wolfson WM8728 DAC, the external clocking system from the NP30 and a 40 watt Class AB amplifier, the Minx Xi has 2.1 speaker connections and a hefty complement of connections. Alongside aptX Bluetooth streaming from compatible computers, smartphones and tablets, there are wired and wireless connections for getting the Minx Xi on your home network. Once connected you can stream from UPnP devices such as a PC or NAS drive, and access thousands of internet radio stations. There's support for a wide range of audio formats incluiding 24-bit/96kHz streaming of high-resolution 24-bit FLAC and WAV files, and 88.2kHz files. Elswhere you'll find three analogue RCA connections for connecting traditional hi-fi components, plus digital coaxial and digital optical inputs and two USB inputs, which will charge portable devices. A remote control is supplied or Cambridge Audio's Android and iOS Stream Magic remote apps are available to take control with your phone or tablet. The Cambridge Audio Minx Xi will be available in October, priced at £600.